Let me just say that I have glorious hair. I say that not out of conceit, but because we live in a culture where women cannot say nice things about themselves. So, I break the cycle here. I have reddish hair, and I grew up being complimented on the color. My hair was stick-straight as a child, but became wavy in adulthood. It’s the kind of hair that doesn’t know if it wants to be curly or straight, and I’m sure that would drive a lot of people insane. Luckily, I’m relatively low maintenance. Below is a tendril of my hair. The picture was taken a few years ago, and now my hair is much shorter and redder than it is in this picture. I currently wear it just past my shoulders, and I haven’t added as much blonde to it, so the red is more obvious than in this photo. The idea to “go wild” began when my stylist/friend mentioned that she hadn’t washed her hair in weeks, and it looked pretty good. She warned me that the first few weeks would be bad. When I first started going to my hair stylist, she mentioned the “no poo” option, and I was intrigued. I didn’t wash my hair for a few days, and then broke down and washing never felt so glorious. I believe that was last fall. Phase One: The first few days were okay. My hair isn’t super greasy anyway, so going a few days was fine. When I showered, I just rinsed my hair really thoroughly with water. Phase Two: I had some doula work coming up, and smell can be heightened during pregnancy. I didn’t want to disgust my full-term moms with my increasingly greasy hair. So, I washed my hair with a baking soda/water mixture. I’ll add that the grease-level of my hair was pretty high at this point, and I wanted to wash it with something besides water to try to cut the grease. The idea of this phase is to get your hair to adjust the output of natural oils. We wash our hair with detergent that is basically a grease-cutting agent that sends hair into oil production overload. Even the good quality shampoo will do this, and trust me I never skimp on shampoo and conditioner. I always purchase high quality stuff from the salon. The problem was that the baking soda left my hair feeling a little dry and stiff at the ends, but didn’t seem to cut the serious grease in my hair. So, I decided to wash my hair by blending a little baking soda with coconut oil (perfectly complimentary, right? Wrong.) In the following days, my hair developed a weird white film that coated my hair and my hairbrush. I think this happened because I was using too much baking soda, and also possibly because of my hard water. So, I made the difficult decision to wash my hair with regular shampoo. I felt strongly that I needed to get that white gunk out of my hair if I wanted to move forward with my “no poo” plan. Note: during all of these phases, even though I was not using conditioner, my hair was incredibly easy to brush, even when wet. I think that’s because the natural oils really were working as a deep conditioner. Had I just washed my hair with shampoo, I would have had a rat’s nest of tangles on my head, guaranteed. Phase Three: Of course the shampoo worked miraculously. I finished it off with a moroccan oil hair mask/conditioner thing that I’ve used in the past. My hair felt really good and clean, but here’s the thing, I don’t think I’m going to need to start over with my “no poo” experiment. I’m already on day three and my hair is not at all greasy. That means, even though I stripped it with shampoo a few days ago, my scalp isn’t overproducing oil like it did before. I’m sure shampooing it was a bit of a setback and that it will overproduce oil again, but this time it’s definitely not as bad. Right now it feels amazing. To be continued… I know that the baking soda problems were probably my fault, but I’m a little wary to put it on my hair again. I already live in a really dry climate, and baking soda just seems too harsh. So, I think I’m going to try castile soap as needed to see if that will do the trick. I still need to do a little more research on castile soap. I’m worried it will also work to dry out my hair and strip the natural oils. At least I can understand the ingredients on the bottle! That’s a good place to start. More later. This entry was posted in doula, life on July 29, 2013 by sherewin. I’ve never had much luck with container gardening. This year has been more successful. I’ve got a cherry tomato and some sort of larger, determinate tomato. 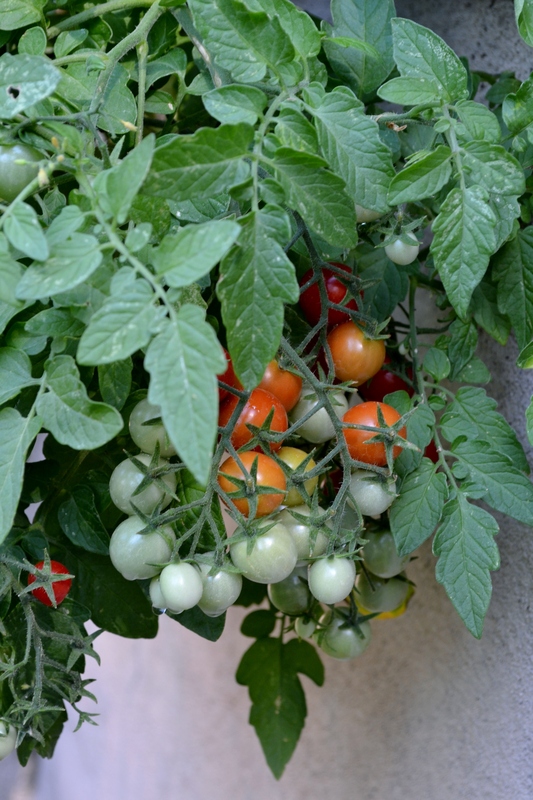 The cherry tomato is producing a handful of tomatoes every few days and the other tomato has produced only a few ripe tomatoes so far, but there are more on the vines. When I visited Oregon a few weeks ago, I had to hang the tomato plants in the basement. It wasn’t ideal, but they would have dried out and died in the Utah heat. The basement has natural light, but of course it is nowhere near what the tomatoes were used to. In the week or two since I’ve returned to Utah and returned the tomatoes to their south-facing roost, I’ve noticed that there are no new blooms on the tomato plants and the leaves look a little drab. I hope that four+ days in a basement didn’t end their season! I also planted a zucchini in a container this year. I had the brilliant idea because I love zucchini and I know they’re prolific. Why not try them in a container? 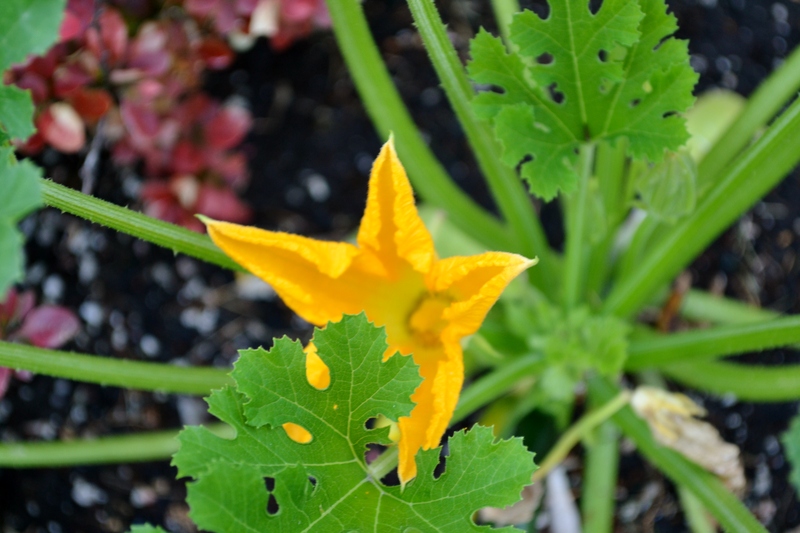 Above is a picture of the first zucchini of the summer. 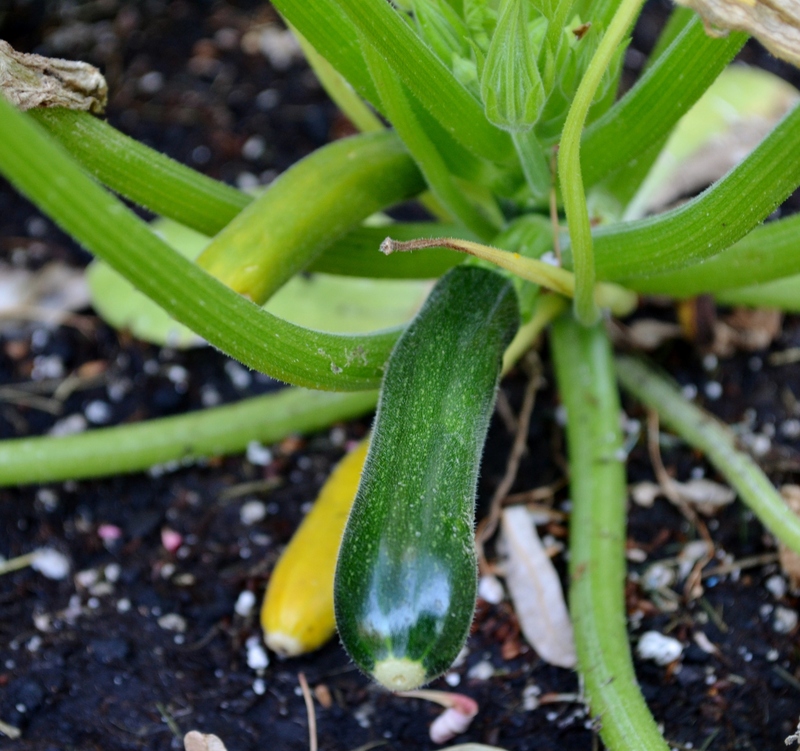 The plant is producing one good-sized zucchini every few weeks. This plant’s foliage is not impressive, but it is putting some energy into growing zucchinis too, so I’m happy about that. I fertilize the container (though I could probably do more), and the sprinkler system actually hits this planter, so it is one of the only plants that I don’t have to water by hand. Some people my be frustrated by the low output of these plants, but honestly, they are all doing way better than most container vegetables I’ve tried in the past. I’m thrilled with the outcome. Pro-tips for next year include adding more fertilizer earlier and continuing with fertilizer throughout the growing season. In the Utah heat, the containers need lots of water and as a result lose a lot of nutrients. 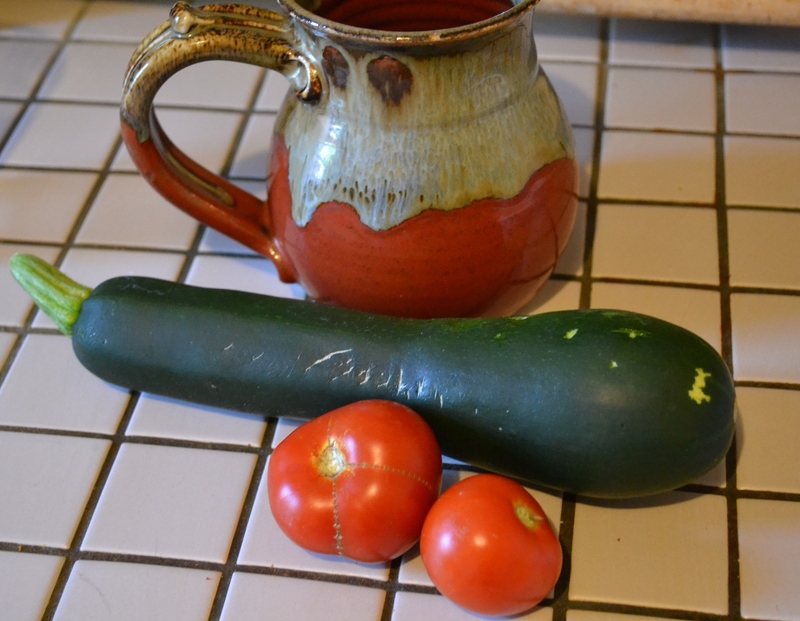 When it comes to gardening, I’m a big fan of growing the kinds of veggies I’ll actually eat and enjoy. Next year I’m going to try to grow kale in a container. I buy and eat a lot of kale, and I frequently see it’s lovely purple foliage in containers. So, that’s my plan for next year–that is unless I happen to live somewhere where I can have the kind of garden that grows in the ground. A girl can dream. This entry was posted in garden, life, travel on July 27, 2013 by sherewin. 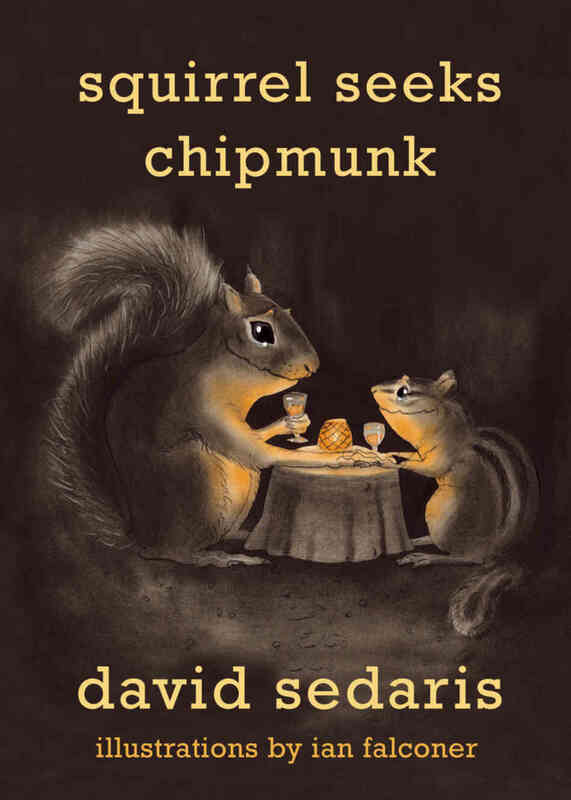 In my pursuit of the newest book by David Sedaris, I discovered his Squirrel Seeks Chipmunk: A Modest Bestiary. Although I adore(d) the title, this was not a book for me at first glance. I’m pretty much a realist fiction kind of person with a good measure of poetic prose. But, since it’s David Sedaris, I thought I would give it a chance. And, I’m so glad I did. It was a delight–as are all of his books. Reading it, I found myself looking forward to the time when I am able to share books with my three-year old nephew. Don’t get me wrong, Squirrel Seeks Chipmunk is not for young children. It is full of f-bombs and adult content, but the protagonists are all animals dealing with real human problems. Not unlike many children’s books that have animal protagonists dealing with real human child problems. Right now, my nephew has a few books that we both like reading together. Lately, I’ve gotten a lot of joy out of The Monster Under My Bed by James Howe, for example. These are not books I would ever seek out on my own, but I appreciate them. I love our time together spend reading a book and naming all of the things we see on a page. I’m already looking forward to the day when we are able to share more of our favorite literature with each other. This entry was posted in books, family, life, reading and tagged david sedaris, james howe, poetic prose, share books on July 23, 2013 by sherewin. After teaching a quick, but difficult, summer session, working on a project, and then traveling to Oregon (twice) and Las Vegas, I’m finally back home and feeling out of sorts. Traveling and running around is hard on me. I thrive on a routine. My visited home this time were necessary and good, but always leave me torn between my family and my own life outside of them, outside of Oregon. I wish I would launch headfirst into writing. I have a creative project that’s been stewing for awhile now, but I just don’t feel like it. Instead, I’ve been tinkering, resting, taking it easy. Tonight I made my first batch of pesto with basil that I’ve grown on my porch this summer. It was delicious. Also, my car is giving me trouble again. A parking lot mishap coupled with an (occasional) problem starting the car has discouraged me. I mean, it runs, but I never know when it’s going to take ten minutes to start. I’ve got some reading material in the back of the car just in case I need to wait. I was hoping to get 200,000 miles out of this car. I’ve already had it for 10 years. But, I’m feeling discouraged. I need to take it to the shop, and that means spending too many hours on the internet at the nearby McDonalds while I wait. So, I’ve been ignoring it and walking everywhere instead. 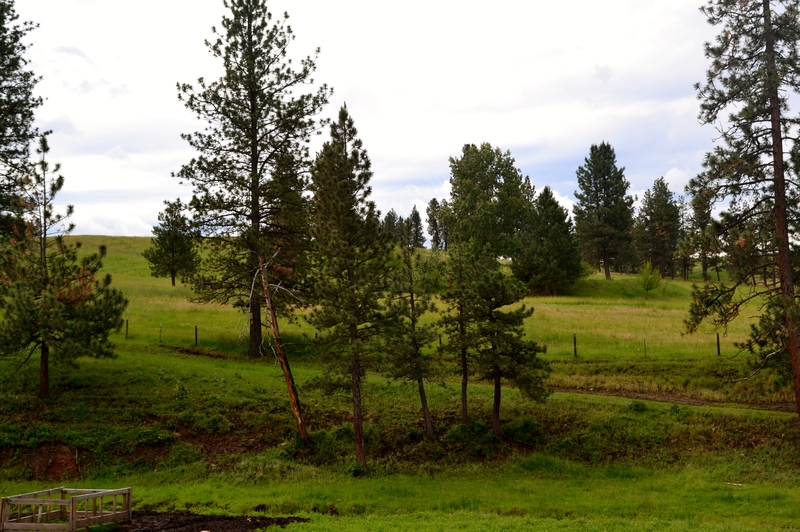 This entry was posted in family, garden, life, travel, work, writing on July 20, 2013 by sherewin. I’m going to be making more trips home to Oregon this summer than I originally anticipated. I’ve been travelings so much, especially to exhausting places like Las Vegas, that I’ve spent the last day just unwinding at home. It’s been great. But, my summer travels are not over yet. Soon enough, I’ll repack my bags and head to Oregon. Which is beautiful, and hard, and emotional, and puts me in a tailspin, but in a good way, and in a bad way. That’s just life, I suppose. This entry was posted in family, life, love, travel and tagged beautiful home, las vegas, tailspin, travels, trips home on July 10, 2013 by sherewin. Some of my Facebook “friends” post status updates and memes that are abhorrent to me. Occasionally they’ll write something so wrong or misleading that I just have to comment and an argument usually ensues. In these moments, I’m often tempted to “unfriend” these people. I don’t do it for one reason: I want to keep my finger on the pulse of their arguments. I want to be in touch with the kinds of argument and thinking that is used. Why? I don’t know. Maybe so that I can more effectively disarm them in future arguments? I don’t really think I’m that calculating. The reality is that I work in the Liberal Arts, and like everyone else who is part of a cultural microcosm (i.e. everyone), I am surrounded by people who often have similar political and philosophical beliefs. I’m so immersed in my culture that I am frequently shocked by some of the thinking and arguments that get made outside of that circle. My thinking is that this is even more reason to keep these people as friends–to stay current on other perspectives. Like some of my “friends” on Facebook, I don’t agree with Vegas. I think it represents a lot of what is wrong with humanity in terms of excess and disconnect. Despite that, I think it is important to go and see and try to understand that this is the reality. It’s a way of staying tuned in to what’s really happening out there for my fellow humans. Sometimes this is hard to remember while I’m over here practicing yoga, gardening, and actively recycling. This entry was posted in enlightenment, garden, life, travel, yoga on July 9, 2013 by sherewin. I think I’ve reached the point where I need to add some routine back into my schedule, or at least something that is 100% relaxing to me. I’ve been enjoying these long summer days with my nephew where we sleep late, “farm” the lawn on the toy tractor, and then cool off in the kiddie pool. It’s all about cold juice, swimsuits drying to a crisp on the porch railing, and biting the tips off wild columbine. I’m also loving the conversations we have at bedtime. As lovely as these days have been, I’m finally getting ready to add something that I really enjoy that’s just for me, something like reading. I’ve tried to read a little bit, but that has quickly devolved into getting splashed by pool water and then lured into a game of little fish/big shark. How do people with kids ever have time to read? This entry was posted in books, family, life, reading, travel, work and tagged kiddie pool on July 3, 2013 by sherewin.